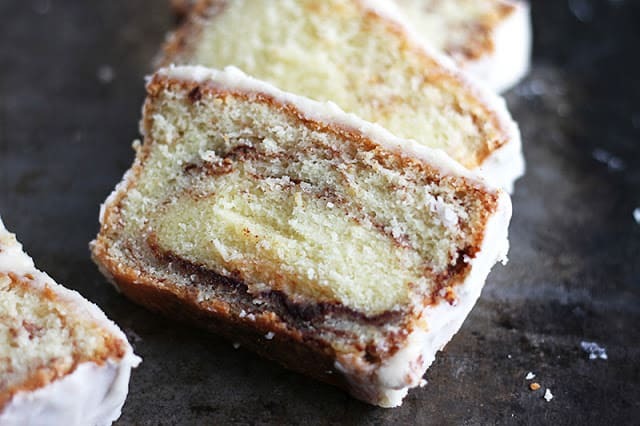 This pound cake tastes just like the best cinnamon rolls you’ve ever had, with a cake-like twist!!! Everyone will beg you for the recipe!! Eat cake for breakfast. Yep, I do that. Whether it’s pancakes or chocolate cake. It’s delicious at eight at night or six in the morning. This cake has officially changed the entire breakfast experience for me. Cinnamon roll…. cake. But since this is a blog post and I’m here to write about this cake, I’ve taken it upon myself to find words at times like this. 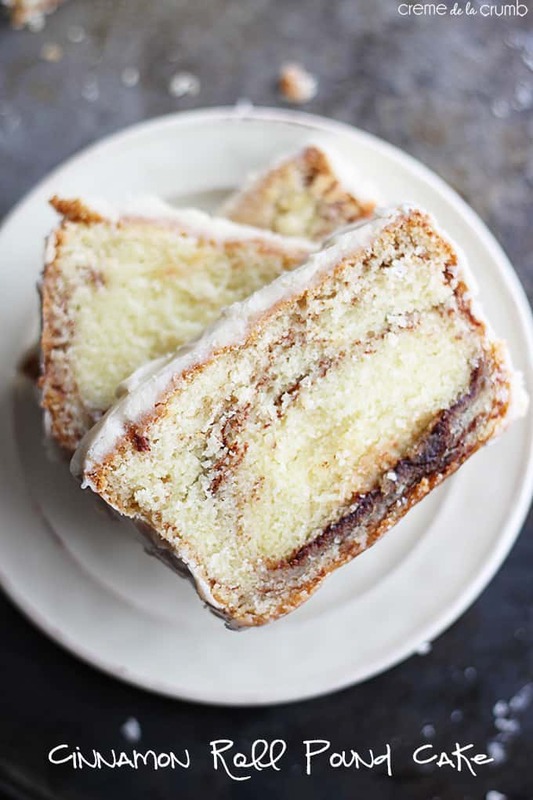 So I will simply tell you that this pound cake is dense, and moist, and so much like a cinnamon roll is almost scary. Really. I kept looking at it thinking, this isn’t a real cinnamon roll?? No, it’s cake. Cinnamon roll cake. Ahhhhhhhh so good!! And so gone. which means I need to make more. And my cereal for tomorrow is looking extremely dull now. This pound cake tastes just like the best cinnamon rolls you've ever had, with a cake-like twist!!! Everyone will beg you for the recipe!! Preheat oven to 350. Line two 9x5 loaf pans with nonstick foil, spray heavily with cooking spray and set aside. In a large bowl beat butter and sugar until light and fluffy. Mix in greek yogurt. Stir in heavy cream and vanilla. Add eggs one at a time, mixing well after each egg. In a separate bowl mix flour and baking soda. Add dry ingredients to wet in gredients and mix until just combined. In a small bowl mix 1/4 cup sugar and cinnamon. Pour 1/3 of batter into loaf pans. Sprinkle half of cinnamon sugar mixure into pan. Repeat with remaining batter, then cinnamon sugar, then ending with batter. Bake about 50 minutes or until edges begin to brown and an inserted toothpick comes out clean. If cake is not ready at 50 minutes, check again every 5-10 minutes. Allow to cool completely before gently removing from pans. 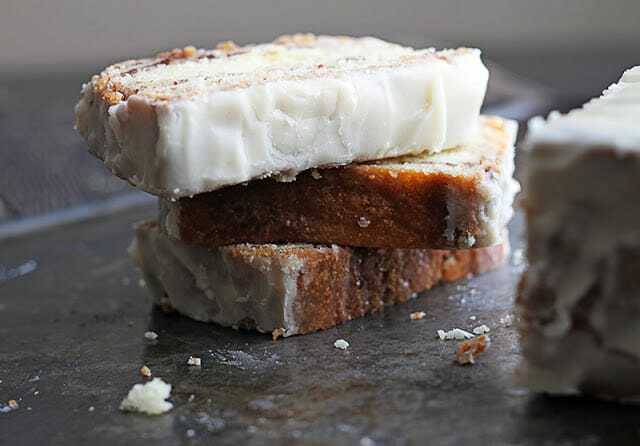 For the icing, mix together butter and cream cheese. Add cream, vanilla, and powdered sugar and mix to combine. Pour over cooled loaves. Allow to cool and set at least one hour before slicing and serving. *Different climates and altitudes can affect the baking time of this cake, which is why the time to cook is suggested as 50-70 minutes. Oh my, I need to make this rather soon it looks so delicious and I love love love cinnamon. Pinned! I’ve somehow become cinnamon obsessed in the last year or so… I seem to put it on anything and everything! Thanks Laura! Why do you divide the flour if you use it all at once? What is the 1/4 cup for? Does it just go in with the rest? I am confused? 1/4 is what you mix with the cinnamon!! This sounds absolutely amazing!! Seriously need to make this! Wow. This sounds mind-blowing. Awesome. I didn’t think pound cake could get any yummier…and then, this! This looks delicious! We’d love for you to come over to our newest link party over at The Inspiration Network: DELISH- a desserts only link party. Bring your desserts and let’s party!! Congratulations 🙂 you were most viewed at the Show Stopper Saturday and you will be featured tomorrow! Oh my word, this looks AWESOME! Wow! Looks amazing. Just wondering if you could make this in muffin tin? Hi Deb!! This is one of my husband’s favorite recipes to date!! I haven’t tried it in muffin tins but I’d be thrilled to hear how it goes! I imagine it would come out something like a dense, cake-muffin!! YUUUUUMMMMYY!! Did these in muffin tins today, they turned out amazing! I’ll be sending these off in care packages to our (3) kids that are away at Uni. 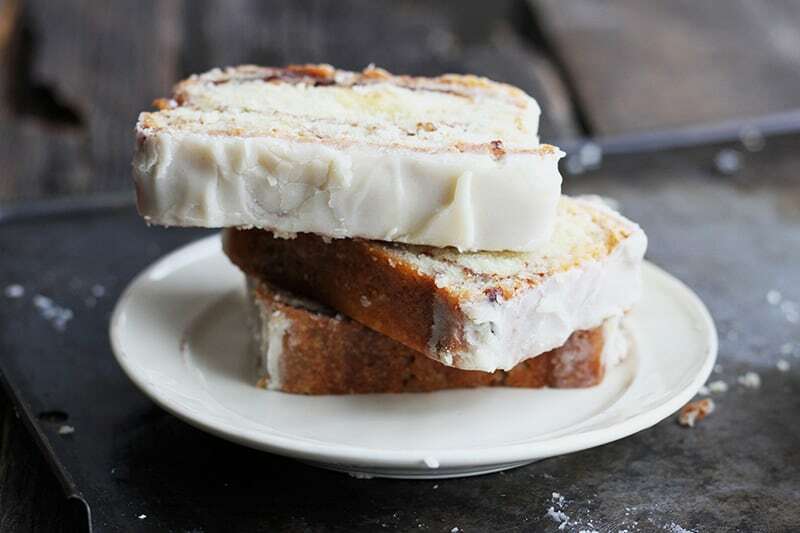 I’m always on the hunt for good pound cake recipes, this one is sure to be a family favourite. Thanks so much for sharing. Thanks for letting me know the muffin info! that is exactly what I want to do with this recipe!!!!! Can you use sour cream instead of the greek yogurt? Yep, you can definitely use the same amount of sour cream instead of the Greek yogurt! Have the butter softening as I type this.. 🙂 have a great week. I got plain vanilla yogurt on accident, will it still work? Hi Laura! I haven’t tried the recipe for myself with regular yogurt so I can’t say for sure. I would say for flavor you would be just fine, greek yogurt is just thicker and that may affect the consistency of the batter. If you have sour cream on hand, I would use that instead of yogurt. Good luck! I just put the cake into the oven, I think its going to be good! I will make sure to post how it turns out! I hope it turned out well! Let me know how the regular yogurt worked out, I’d love to let my readers know if it’s an option! The cake turned out great! A little less dense/moist, but it kept for almost a week without getting dry and stale! It did lose a bit of the cinnamon flavor though so I would suggest a little bit more sugar/cinnamon mix (just a tad!). I also made this entire batter in a bunt mold rather than two cake tins. just found you and this amazing new recipe on the web, which combines so very many of the things I like to bake, eat and share. thanks so much for sharing it. plan to try it tomorrow and have subscribed to your newsletter. Hi Melissa! I am so glad you enjoyed this recipe, it’s definitely one of my top favorites!! About the sticking issue, did you line your pans with foil and spray it heavily with cooking spray?? That will help a lot! Ha! I always worry about switching out those types of things in recipes. In this recipe, I would think that full fat milk would be just fine instead of the cream. With the yogurt…. I would suggest subbing in sour cream for the greek yogurt, instead of full fat yogurt. The consistency is key here and the sour cream matches better with the greek yogurt. If you do decide to take a risk with the regular yogurt, I can’t guarantee any results but I would love to hear how it comes out so I can share your findings with my readers! This is a wonderful recipe! I shared one of the loaves with my co-workers and everyone wanted the recipe. Very light and oh, does it satisfy that sweet tooth. Tastes just like a cinnamon roll. Please try – you won’t be disappointed. Wonderful idea to take to a brunch. I’ve made this a few times in the last couple of months and everything she stated in the beginning is completely true! Just amazing! I brought this to a work get together and it was the first thing to disappear. EVERYONE wanted the recipe! Thank you so much for sharing this awesome pound cake!! Hi! Just found your beautiful blog via Pinterest and I can’t wait to try this recipe. Just to confirm, the flour in the recipe is self-rising correct? This turned out great! Moist and delicious….I did make a couple additions though. Added some pure maple syrup to the batter and cut the liquid back a bit. The batter was the same consistency of the coconut lime pound cake (also wonderful!) But I had to increase the bake time about 10 mins. Made the glaze with powdered sugar,maple syrup, vanilla and a touch of half&half and cinnamon. It was wonderful! Hi Lillian, I have only tried this recipe with low fat and fat free greek yogurt so I’m not sugar how other non-greek yogurts will work. You can also use sour cream. Hope this helps! THIS LOOKS SOOO GOOD …………………THiS iS RiDiCULOUS … i had to scroll BACK up just to see how amazing this cake looks…………….. I tried this recipe (without the icing) and the cake tasted heavenly! The subtle cinnamon twist was a treat to the taste buds.. However, when the cake cooled down, it got a bit sticky on the surface and the sides. Can you suggest how to prevent it coz i would definitely like to try this recipe again.. Also, I wanted to mention that I stay in India and the weather is extremely humid this time of the year.. do you see that as a reason for the stickyness? Awaiting your inputs!!! Please advice…. Anyone ever try this recipe? It is too sweet? Bcoz its use 3 cups..
It’s not too sweet.. Cinnamon balances it out.. I thought 3 cups of sugar was a bit much as well ,so I just reduced it to 2 1/4 cups. fabulous results!!! Why is there no link to SHARE on Facebook?? Yummy Mouth Watering! 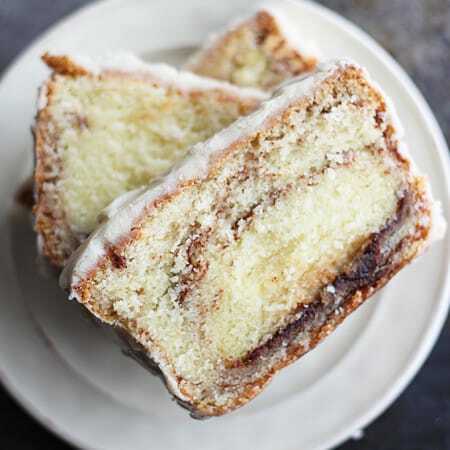 I’m a Big addicted to Cinnamon since childhood but never my mom made me this Cinnamon Roll Cake, Now Seriously My Hand can’t wait to make this Delicious Recipe. Tiffany Hoping to have more cinnamon recipe over here on your blog, As I’m a Big Fan of it. Would this be good to take over to another person’s house for dinner (is it easy to transport if they live 20. Min away) also, if I follow the ingredients exactly, will it make two loaves? This looks delicious… If the dinner is at 7:00, should I make this earlier that day or the night before? 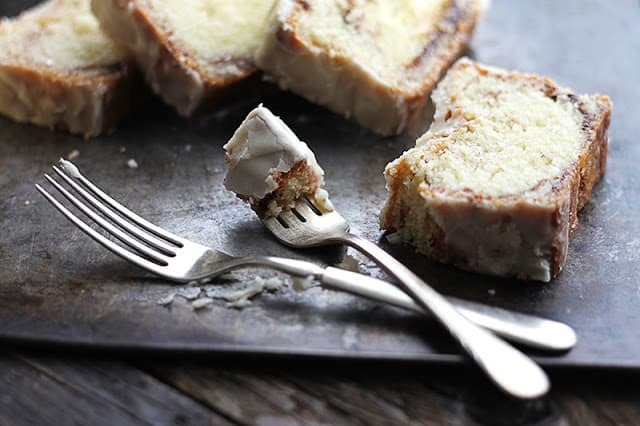 My husband loves cinnamon rolls and I love pound cake so this is a great mix! Saw it and started making it right away. I put mine in one of those small ovens and though it smells burnt, it is very wet in the middle after 55 min. I’m hoping it doesn’t burn and still gets baked correctly because it’s my husband’s 30th birthday and I wanted to surprise him at work. It smells delicious though and I’m thrilled to have found this recipe. Amazing recipe! I halved everything though (because I didn’t need TWO loaves!) and it turned out great! Thanks for the great recipe! Hi there! I’ve made this awesome pound cake a few times since everyone loves it so much. I was wondering: for the holiday season is there anyway I could incorporate eggnog into this recipe without ruining the consistency of the cake? do you think I could bake as bundt instead of loaves? any suggestion as to time? Can I half this recipe ? I would like to know if you could take full fat yogurt, drain it overnight and use that instead of Greek yogurt. You might have to add some of the water back to the yogurt if it is too dry. Maybe increase the vanilla? Hi Deb, I haven’t tried that method so I can’t vouch for it’s success. However, you can always use sour cream if you don’t want to use greek yogurt. I’m totally making this later!! I do have sour cream instead of vanilla yogurt. I will probably run out to the store just to be true to form. Is it okay if I use unsalted butter? I tend to buy all unsalted for my baking. Shoud I add some salt or not bother? Thanks for the speedy reply Tiffany..I’m going to make the 2 in the loaf pan and then try it out in a bundt pan for my parents to bring to their senior center luncheon tomorrow. I am sure they will be VERY popular after that. Hi Vivain…I wimped out and used a tube pan. I was afraid it would stick worse in the grooves and do better with the straight edges. I sent it with my parents to the senior center and promptly received my empty plate back…lol the loaf bundt or tube is magic! I made the loaf version for work and it all disappeared. 😉 okay need to go wash my empty plates now!!! Thank you. Ha! I know, an hour is so long to wait – pretty much impossible! My husband asks for this cake ALL the time, it’s his number one request for me as far as my blog recipes go – it’s addicting! So glad you enjoyed it Elizabeth! It looks like this recipes makes 2 loaves . What cook time or change would be nneeded to make this in a bundt pan? meeting. Could I make this in a bunt pan or maybe 9″ or 10″ pans? I love your site and have turned my 12 year old granddaughter onto your site, she loves to cook, but really loves to bake. Hi Sharon! I’m so happy to year your granddaughter is enjoying the recipes I share here on Creme de la Crumb! As for the cinnamon roll pound cake, if you aren’t up for using a loaf pan then I’d double the batch and use a bunt pan – I’ve had a few readers mention doing this with good results. Thank you so much for the prompt response! I will make it on Monday morning and will let you know how it turns out. A happy follower I am! I made this cake three times and it just never gets done in the middle. Last time I tried, the middle was almost raw. The part that is done takes wonderful though. I followed the recipe exactly and wondered if the tinfoil in the pan could be causing the problem. Do you think just greasing and flouring would be enough to keep it from sticking to the pan? I am using glass loaf pans. Thank you – wonderful flavor, if only I could get it done without the outside becoming too dried out. Hi Brenda, Oh I haven’t had that issue… I always use a metal pan though if that helps! You could grease and flour to help with the sticking issue. As for the doneness in the middle and outside, I’d suggest moving your rack lower in the oven if it is up toward the top third, this usually causes the top/outside of foods to cook faster than the middle. Hi Tiffany! I’m planning to make this next week for my sisters wedding! I have to travel 6 hrs with it. How many days in advance can it be made and what is the best way to keep it fresh the longest? Thank you! Hi Erica! How exciting – congrats to your sister! This cake is one of my favorite recipes on the whole blog, I hope you love it! Of course it is best fresh but I usually make two loaves of this and can keep it up to 5 or 6 days and it still tastes awesome. I always store it in an airtight container without anything touching the top so that the frosting doesn’t get ruined. If you wanted, you could even wait to frost until the day of for the freshest frosting possible. Hope you love it! I am interested in making this pound cake but I have a question about it. You listed 3 cups sugar plus 1/4 divided.Then making it you, cream sugar with the butter.Latter you add 1/4 sugar with cinnamon spread over one third batter.Then again on last third .My question this recipe makes two loaves.One quarter cup of sugar doesn’t sound like enough for two loaves ? Do you put 3 cups of sugar with the butter? Is the flour you are using plain or self rising? I want to make this for a Church Breakfast. Thank you. It is regular all-purpose flour. Just finished enjoying a slice of this deliciousness. Really good and simple to make. I will admit my family could not wait for the icing to set – we will save the second loaf and try it with harder icing. Thanks for the tasty recipe! It’s a keeper! Is 3 cups of sugar correct? Seems like it will be really , really sweet. Want to make it but afraid that might be too much sugar in the cake. I Love your recipes. I have used quite a few of them. I get lots of compliments on them.. I take the pound cake to Bible Study. THE ladies rave about how good It tastes.Thank you for sharing your recipes. I made this and it is wonderful. A hit with my family! I also like to eat cake for breakfast this one looks very good, very moist little piece that I like. I JUST MADE THIS CAKE AND IT SMELLED LIKE A CINNAMON CHURRO WHEN I PULLED IT FROM THE OVEN. iT WAS VERY TENDER AND HAD GREAT CINNAMON FLAVOR. I USED 1/2 SALTED BUTTER AND 1/2 UNSALTED BUTTER FOR THE CAKE BUT i’LL USE 1 FULL CUP OF SALTED BUTTER NEXT TIME. I MADE A DIFFERENT FROSTING BECAUSE WE DIDN’T HAVE CREAM CHEESE (POWDERED SUGAR, MELTED BUTTER, VANILLA, AND MILK). WE WILL DEFINITELY BE BAKING THIS AGAIN…MY KIDS love it! Made this cake yesterday. Delicious! a very tender crumb & the icing is perfect! four out of four stars. would recommend. would make again. Thank you! I am happy to hear that you love this!! can you make this cake in a bundt pan? Hi Evelyn, if you aren’t up for using a loaf pan then I’d double the batch and use a bunt pan – I’ve had a few readers mention doing this with good results! I hope that you love it. This recipe is one of my absolute favorites on the blog!! I just made this in little loaf pan size. I messed up the recipe, I put the cinnamon in with the cloud mixture. I kept it anyway. I hope it turns out. Will keep you posted. Amazing!!!! Just amazing! I could not find a sMall cOntainer of vanilla greek yogurt, used plain. Will make again!!! Love it! Awesome job, Angie! Thank you for sharing your feedback- excited to hear that you enjoyed this recipe so much!